The most comprehensive line of checkweighing solutions for all industries. The robust performance of these checkweighers allows their use in most industrial production situations. Heavy load checkweigher suitable for weighing applications in wet and dry production environments. Dynamic checkweigher suitable for standard applications in food and industrial environments. Configurable with 90 performance and productivity enhancing options to optimize the product transfer of large heavy items and create stable weighing conditions delivering optimum weighing results. The robust C21 is designed for use in dry production environments across many industries. The rugged stainless steel construction and open frame make this system easy to install and clean. The C21 features a choice of MID-approved electromagnetic force restoration (EMFR) weigh bridges or strain gauge load cells designed to withstand heavy-duty loads and minimize weighing errors. Highly customizable with 150 performance and productivity enhancing options including vibration-decoupled sorting devices to prevent product damage. This customizable heavy load checkweighers has an open frame and robust stainless steel construction which is easy to clean and suitable for the use in dry and harsh, wet production environments. 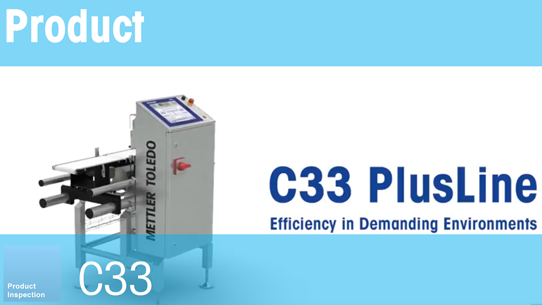 The C23 is available as an integrated solution with a Safeline metal detector as a compact, space-saving combination system uniting contaminant detection with precision weighing. Configurable with 100 options for smooth product transfer and solid weighing conditions for a wide variety of open or closed products in food and industrial production environments. Water protected design (IP65) with sloped surfaces and optional stainless steel conveyors to support cleaning regimes and minimize downtime in a wide range of production environments. The C31 as a combi solution with a Profile Combi LS metal detector is suitable for food and industrial segments where space is limited, providing effective contaminant detection and weight control. Dynamic checkweigher suitable for challenging applications in food, pharma and industrial environments. Dynamic checkweigher suitable for the most complex applications in a wide range of food, pharma and industrial sectors. Highly configurable with 200 standard and customizable options for demanding production requirements ensuring smooth product transfer and unparalleled weighing accuracy. Water protected design (IP65), for endurance and maximum reliability to perform in dry and harsh, wet environments. The open design and 4 feet frame support cleaning regimes and minimize downtime. The C33 is available as an integrated solution with a wide range of advanced Safeline Profile metal detectors. One compact machine delivering highly effective contaminant detection and weight control. Fully customizable with 250 software and mechanical options providing optimal and smooth product transfer conditions on to, and from the checkweigher for demanding production environments. Water protected design (IP65) featuring high-performance stainless steel conveyors with easy belt removal. Customizable design to deliver precision weighing in dry and harsh, wet production environments. The C35 can be integrated with a wide range of product inspection technologies including metal detection, X-ray and vision inspection in the industry's most compact design featuring only 4 feet. Combining checkweighing and metal detection technology help you to find undesired metallic contaminants and increase your production lines productivity. Combination systems with checkweighing and x-ray inspection technology find contaminants such as shards of glass, pieces of plastic and bone fragments which are 'invisible' to metal detectors. Checkweighing and vision inspection technology prevent label-mixup and significantly reduce product giveaway in your production line. This White Paper explains how dynamic checkweighers can optimize production processes with intelligent software solutions. 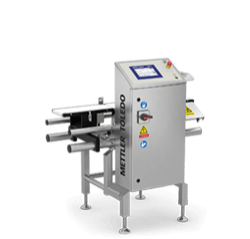 A checkweigher is a high-precision weight measuring instrument. It is designed to check the weight of individual products during the manufacturing process on production lines. Checkweighers are predominatly used as part of a manufacturing quality control programme. Their weighing results are required to ensure that manufacturing sites comply with local packaging laws and regulations during production. What are the Components of a Checkweigher? There are many different checkweigher designs in common use. The components used to construct a checkwegher will vary in details depending on how they are used. The characteristics of the items being weighed and their surrounding environment are also have a strong impact on the design. What are the Differences Between a Static and Dynamic Checkweigher? Static checkweighers measure the weight of products that stand still. Dynamic checkweighers weigh products in motion. Static checkweighing is a labour intensive process. It requires manual product weighing, recording of the result and then product removal for the next weighing procedure. Dynamic checkweighing is entirely automatic. Products are weighed as they pass along a production line, with off-weight products rejected from the production line by automated removal devices such as pneumatic pusher arms or air-jets. The choice of checkweighing system used on a production line is usually dictated by application requirements and processes. Reasons for a Checkweigher in Your Production? In addition, a checkweigher can effectively improve your overall equipment efficiency (OEE) and thus reduce your total cost of ownership (TCO). 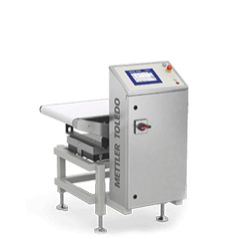 METTLER TOLEDO standard and highly customized checkweighing solutions are built to suit your specific applications and environment, as well as your regulatory and industry requirements. We deliver productivity and profitability via the most comprehensive line of checkweighers for the food, beverage, pharmaceutical, chemical and non-food industries. A wide range of sizes and configurations (such as multi-lane checkweighers, different sorting devices, belt-designs and product guiding systems) are available to handle nearly any container type or package design, even at high production rates, to ensure accurate product delivery, reduced giveaway, and optimized production processes. The innovative dashboard-style controls and intuitive multi-lingual operator interface make product set-up and changeover fast and error-free, to ensure maximum uptime and productivity. 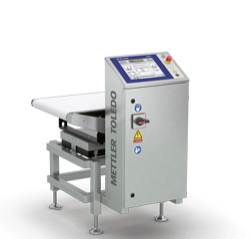 Optional harsh wash-down design up to IP69k and integrated metal detection and X-ray technology complete the impressive features of the METTLER TOLEDO checkweighing product portfolio.